From RICOH on Jan 26, 2018. Official page here. We have found that a small portion of the Ricoh Theta V units exceeded the declared value for Radio wave output of WLAN (5GHz) for both US and Canada. 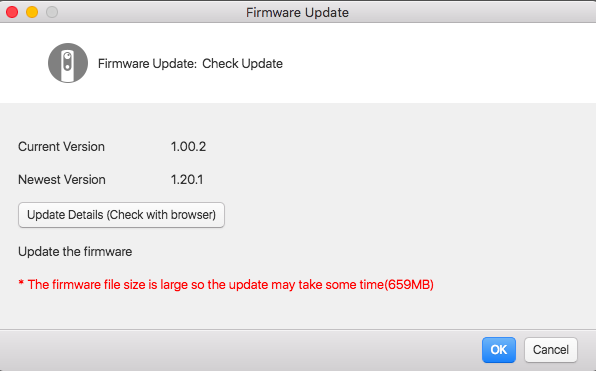 Therefore, we have corrected the output values corresponding to these individual units via firmware update. 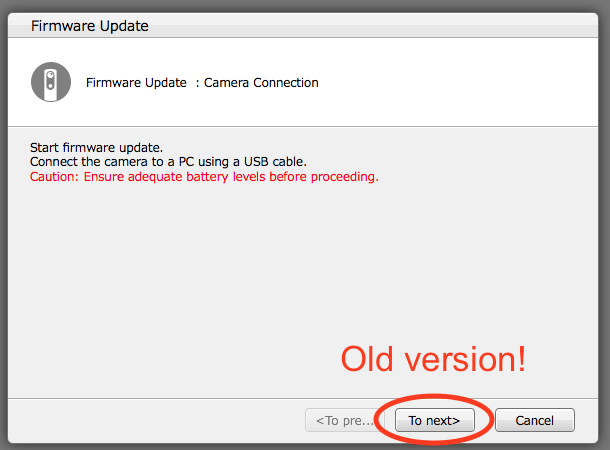 For details on how to update using Computer application, see “Updating the Camera Firmware from the Computer Application” in the User Guide. Still image joining accuracy has been improved. Subject shake when shooting video has been reduced. *Noise may increase depending on the shooting conditions. Purple fringing has been reduced. Resolved the problem that weakened the spatial audio effect when recording with the 3D microphone (TA-1). Changed the default time until auto-shutdown from 48 hours to 18 hours. 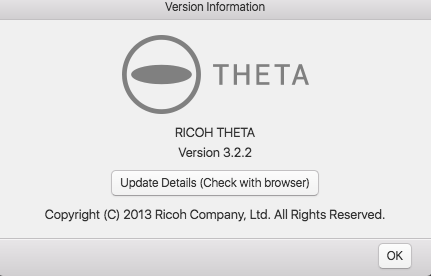 RICOH has released a firmware upgrade for the RICOH THETA V. The newest firmware version for the RICOH THETA V is “Version 1.20.1”. Is your desktop app up-to-date? First make sure your desktop app is up-to-date. It should be Version 3.2.2. I installed it on an iMac (mid 2010) running MacOS X 10.10.5 (Yosemite) and also on a Macbook Air (early 2015) running 10.11.6 (El Capitan). 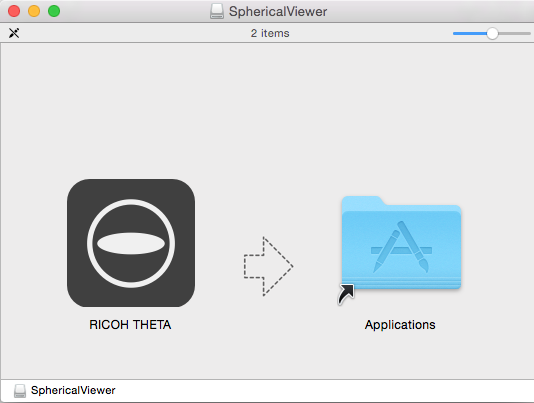 Run through the normal Mac download process, double clicking on the SphericalViewer.dmg icon, and moving the RICOH THETA app to the Applications folder. Run the app, confirm that it’s up-to-date, version 3.2.2. Turn on your THETA V, and connect it to the Mac with the USB cable. The power light should be on. 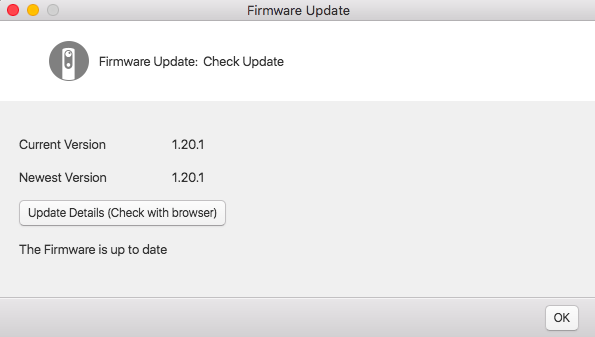 Also please Note, if the firmware update status message looks like this, and the main next action button is To Next> you need to update your desktop app. If so, go back to the Is Your Desktop App Up To Date? section above and make sure the desktop app is installed properly. 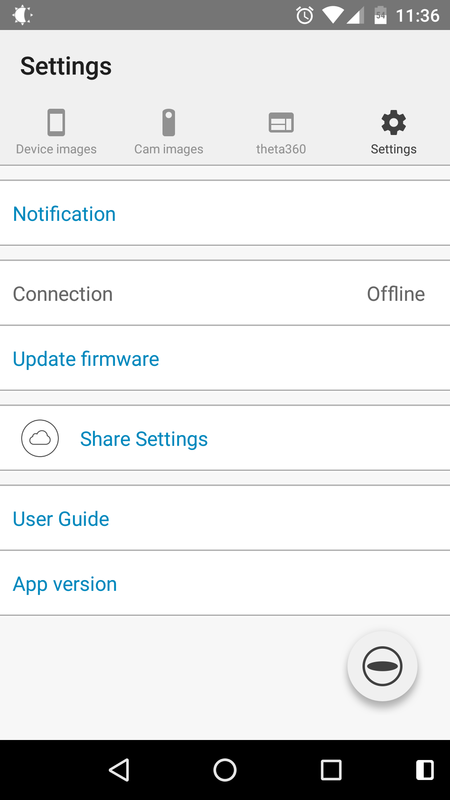 The firmware update status message should look like this and the main next action button should be OK.
You will get a brief status message “Transferring firmware to camera,” which will turn into a spinning wheel in upper right corner of the main app window. For me, the spinning wheel continued for 5 minutes, and had appeared to hang. I didn’t want to unplug the THETA V during the installation. So I kept the THETA V plugged in and just restarted the application and redid the firmware upgrade steps. NOTE: This has happened with multiple firmware installs now. It does not end, after about 5 minutes, I restart the app, check the version number, up-to-date. from where you can update. I had already updated my firmware via the PC when I took these screenshots. 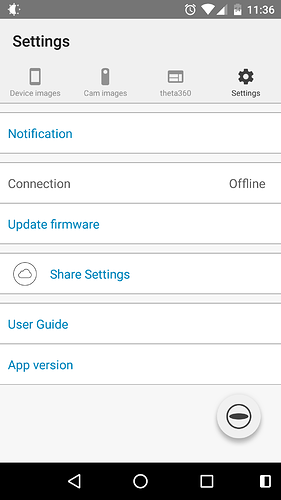 You can see the app isn’t connected to the camera and was showing the firmware from the last time that they had been connected. It looks like it will download the firmware and then use wifi to send it to the camera for updating. I’m noticing on the News page at theta360.com that it also mentions that using the Android app it’s now possible “to remotely shoot images by pressing the volume button on your smartphone.” Have you tried this? I’ll test it on iOS but it doesn’t appear like that’s available.